It is mid-September here in central Texas, and temperatures are still in the high 90s across the Texas Hill Country. While I’m tired of sweating on every photographic outing, I am ready to turn my attention to the coming fall colors. I’ve been fortunate to spend some time in Colorado over the last few Autumns, and I know that the changing aspen leaves there are simply amazing. While Texas really can’t compare to the changing aspen that can cover an entire mountainside, our Lone Star State can offer some very pretty places to capture Texas images of changing leaves. One of the popular locations for Texas Hill Country images in Autumn is Lost Maples State Park. This hidden gem hosts an old growth of maple trees that turn red each fall – usually in late October through early November. But be warned, the crowds can be intimidating. I’ve been there a few times in the fall, and while I am usually through the gate and hiking before sunrise, when I leave around lunchtime the line of cars trying to enter the Texas state park can often exceed a mile or two. Another nice little area in the Texas Hill Country is Hamilton Pool. Take a walk to the grotto area and you’ll find nice cypress trees that turn red and orange. For photographers, the biggest issue with Hamilton Pool is that their hours are restrictive. The gates are only open between 9:00am and 5:30pm, meaning you miss the magic hours of sunrise or sunset. I’ve stayed until they kicked me out (nicely) but I still missed the best light. Just a few miles away is Westcave Preserve, another gem in the Texas Hill Country. Because this preserve is privately owned, you can only visit the grotto in a guided tour. I was fortunate enough to do some photography for their marketing, so I was able to spend some time there in the evening, but it was still not enough time (is it ever?). I hope to return there in fall when their large cypress tress are changing colors. 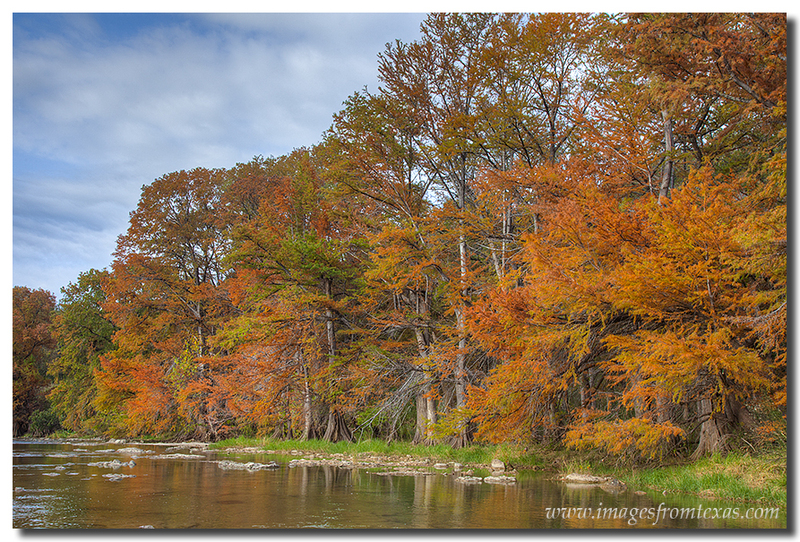 One of my favorite central Texas locations for fall colors is Pedernales Falls State Park. Here, the hours are not so restrictive, and the cypress whose leaves change to orange and red along the Pedernales River are beautiful. I stopped by here last year when returning from a sunrise shoot at Luckenbach, Texas. I arrived there about 8:30am, hiked down to the river, and was greeted by an unexpected display of beautiful orange cypress. The Pedernales Falls State Park image below came from that morning. Along the river, however, there are multiple places and vantage points for capturing photos. Just bring a good tripod and some comfortable walking shoes and you’ll have a great time. Image of Pedernales Falls in Autumn in the Texas Hill Country. To see more, visit my Texas Hill Country gallery. I also invite you to follow my photograph on facebook. The week of October 20-26 is Native Plant Week in Texas. I’ve teamed with the Native Plant Society of Texas by sharing some of my Texas Wildflower images to help promote this week. Their motto is “native plants = healthy habitats.” You can read more about their efforts at txnativeplantweek.org. 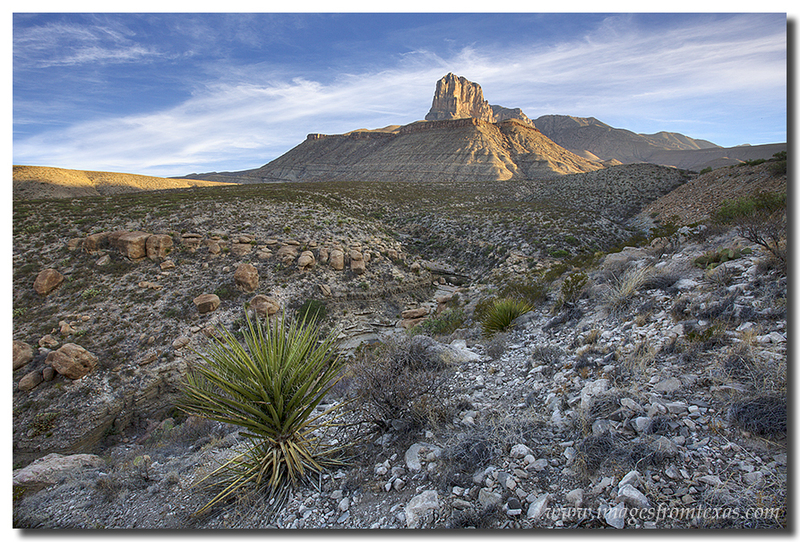 Of several images they are using, one is from Guadalupe Mountains National Park and depicts a yucca in front of El Capitan, Texas’ 8th highest point. This national park is about an hour’s drive north of Van Horn, Texas, and is the middle of the Chihuahua Desert. El Capitan rises from the desert in this image from Texas. 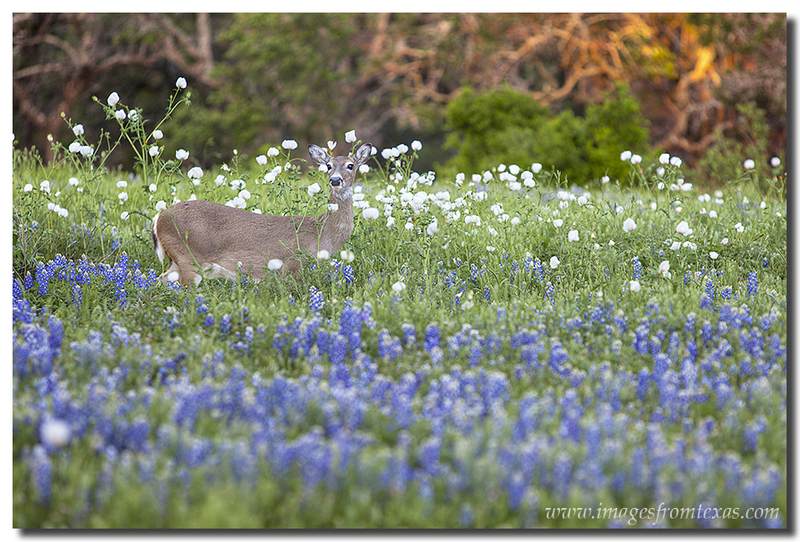 Another picture helping promote Native Plant week is a Texas wildflower image showing a deer in a field of bluebonnets. This bluebonnet image was captured in the Texas Hill Country in the Spring of 2012. For more Texas Wildflowers Images, see the Bluebonnets and Wildflowers Gallery. For more Images from Texas, check out my Images from Texas website.